Survivorship is a strategic initiative that is a partnership between Walker Family Cancer Centre, Primary Care, Cancer Care Ontario, patients and their families. Walker Family Cancer Centre is committed to ensuring that patients and Primary Care Providers are well educated and feel supported during this time of transition of care. Below you will find resources that have been developed in a collaborative approach to improve your understanding and transition of patients completing their care here at the Walker Family Cancer Centre. 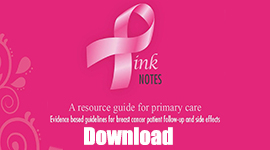 We have adapted “Pink Notes – A Resource Guide for Primary Care,” with the permission of the South West Regional Cancer Program and encourage you to download and have these available to guide you in your provision of care to these patients. Your patients have had the opportunity to attend a “Wellness After Breast Cancer Treatment” Class offered at the Cancer Centre, and all are encouraged to access the multitude of community resources available to them that will support them through this transition period. The links to the class as well as printed resources for patients have also been included for your information.